A new year always brings with it new trends and the death of old trends. When planning a wedding it’s important to keep up with the current trends but still plan a wedding that is timeless and won’t seem dated when you look back in the future. Here at Waterside Events we’ve picked the biggest trends of 2017 that we believe will still be beautiful and timeless in the distant future. The vintage trend will be continuing throughout 2017. Think soft pastel hues, romantic soft petal flowers such as pansies, peonies and roses, lace and vintaged furniture. Another trend which will be huge in 2017 and works beautifully with a vintage theme is greenery. Brides are incorporating greenery into their bouquets, their table decorations, their grooms’ boutonnieres and their ceremony backdrops. Greenery adds an element of softness to any wedding theme, and looks especially beautiful with vintage accents. Although vintage themed weddings are huge at the moment, it is becoming increasingly popular to work modern elements into your wedding. Mismatched bridesmaid dresses is a modern trend that has been growing in popularity over the past few years. Women come in all shapes and sizes and this will often be true of your bridesmaids, so a dress that looks stunning on one of your bridesmaids often won’t be particularly flattering on the others. Many brides overcome this by picking a colour and then letting their bridesmaids pick a dress that suits them in the chosen colour. Some brides are doing away with one colour now and giving their bridesmaid a couple to choose from and letting them pick their own dress. Another modern trend that is appearing in weddings and will be popular in 2017 are alternative desserts. It is becoming increasingly popular to do away with wedding cake as dessert and serve your guests your favourite dessert, (think donuts, pies, ice cream sundaes). Doing away with the traditional bouquet and garter toss is also becoming very popular and set to increase in popularity in 2017. 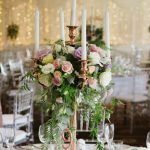 Another popular 2017 wedding trend is incorporating metallics into your colour scheme. Think gold, copper, silver and rose gold. There are so many different ways you can incorporate metallics into your colour scheme, through your bridesmaids’ dresses, your bouquets, your table decorations, and when teamed with pale shades such as blush pink and greenery it looks absolutely stunning. If you aren’t interested in having a vintage wedding then we have good news for you. Bright colours are making a comeback! Splashes of bright colour look great against a garden wedding backdrop which is another 2017 wedding trend. Garden weddings look great with just about any theme and they are a great setting for many of the popular 2017 wedding trends. Unique ceremony backdrops is another trend that is going to be big this year. Picture saying your vows with the picturesque Currumbin Creek in the background and a gorgeous arch made of greenery framing you and your fiancé. Although floral installations that hang from the ceiling are very popular, many venues won’t allow you to hang a huge floral installation from the ceiling, so you will need to think about how you can incorporate your installation into the space you are using. A fun trend that has been on the rise for the past couple of years and will continue to become more popular is ‘first look photos.’ This fun idea has the photographer taking photos of the groom when he turns around and gets his first glimpse of his bride walking down the aisle. These touching photos will be something the happy couple can treasure for a life time. If you are planning your big day and need some more inspiration, why not chat to our expert team at Waterside Events whose beautiful function rooms are the perfect spot for your Gold Coast wedding. They have all the knowledge to help you plan the perfect wedding. Send us your enquiries.